I remember our first Thanksgiving. Chicago. Snow. Fantastic parade featuring Pilgrims wearing Ugg boots. And though it’s not snowing here in NY, it’s the kind of weather where a cup of tea and a slice of cake is most appreciated. This spiced pumpkin apple cake has all the flavors of fall, and, if you ever so slightly under cook it, it takes on a texture somewhere between cake and pie, damp and soft. For a cakier cake, add a tbsp more flour and cook for the full hour. Once baked and cooled we’re on to the really good part; a beautiful buff maple glaze, or a full on cream cheese maple frosting. Either way, it’s a perfect Monday treat. This entry was posted in The Monday Treat and tagged apple pumpkin cake, cake, pumpkin, pumpkin spice, Thanksgiving. Bookmark the permalink. 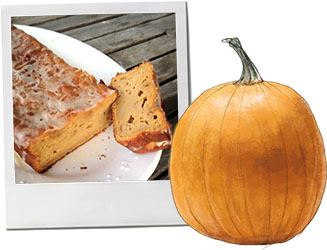 I love pumpkin bread/cake, and the addition of apple sounded good, but I was wary of the maple– and pleasantly surprised! Love the website and the drawings and stories. It’s like a J. Peterman catalogue for cooks! Ha! I’m so glad you’re enjoying the maple – and the blog! I love idea of a glaze on the cake. I have some people in te family who aren’t that keen on icing so I could use the glaze and then maybe put the frosting on cupcakes (it sounds too good not to have any frosting!). Yum! It’s really good frosting, but as you can see from the picture, I made it with the glaze this time – it’s really easy and quick – and tastes much more complex than it is. It’s good on apple cake and on plain loaf cakes too. Somehow the maple syrup stops it being too sweet – I know that doesn’t sound entirely rational, but there’s something about the smokiness … also, it’s a very glamorous buff color. Lovely. as you know, i only seem to cook on holidays.. and i knew you wouldn’t fail me with thanksgiving inspiration. this sounds amazing! Happy Thanksgiving! Glad you like the sound of the cake – it’s a good thing to have around over the holiday for impromptu snacking. I just made a variation on this frosting for a banana bread I discovered on 101 cookbooks – 1/4 cup icing sugar, 1/4 cup dark brown sugar, 4 tbsp lemon juice. Very nice.